This is a bit of a rush job – I just thought of it this morning. I think the inspiration is pretty obvious. Hopefully it will at least give folks a laugh. The old manor that overlooks the harbor is well known to the locals, who avoid it at all costs. Owned by a successful ship captain, it was once the jewel of the town. It seems the ship captain planned to wed a local girl of tremendous grace and beauty, and invited her to live in his home while he was away on a voyage. On his return, they would be wed. His only request was that she never venture into the attic! Alas, on the happy day the guests arrived at the manor and made merry in the ballroom while the bride was dressed and made ready. The handsome captain arrived home and sought out his bride, and was aghast when he discovered her in the attic. Her curiosity getting the better of her, she broke his only request and discovered his secret – a chest of pirate booty! The man strangled her and then hung himself. If only this was the end of the sad tale – for the ghost of the pirate now descended on the happy revelers, sealing them into the manor and murdering them. Their spirits now haunt the mansion and challenge any who would venture in to discover the pirate’s treasure! The mansion has wooden walls that resist all blows. Doors are also made of wood, but quite resistant to battering, and they always close on their own a few minutes after being opened. Windows are apparent on the outside of the manor, but on the interior either disappear entirely or allow no light to enter. The rooms and halls are appointed with candle sconces and candles lit with ghostly lights. 1. This entry hall is dusty and covered with cobwebs, but otherwise well appointed. An opening in the north wall leads into the gallery. Once the gallery has been entered, the opening is shut by a sliding wall that foils all attempts to force it open. 2. This gallery has a high ceiling and several portraits of aristocratic folk. Once the sliding wall has closed, the gallery will appear to stretch and the portraits will take on a sinister aspect, depicting their aristocratic subjects dying grisley deaths. A ghostly voice will call out, taunting the adventurers that there is no escape from the room. As the voice laughs menacingly, the gallery goes dark and then the ceiling is lit as though from a bolt of lightning, revealing a body hanging from the rafters. Each henchman with the adventurers must now make a saving throw or be possessed by a spirit of death that will transform them into mouldering coffer corpses. Coffer Corpse: HD 2+2; AC 7 ; Atk 1 fist (1d6); Move 9; Save 16; CL/XP 4/120; Special: Only harmed by magic weapons, choking. 3. This dark hallway is decorated with pictures of mouldering corpses and two busts that follow the adventurers progress down the hall. 4. This room is a kitchen inhabited by a poltergeist. The kitchen contains numerous knives, rolling pins and other dangerous objects. Poltergeist: HD 1d4; AC 9 ; Atk None; Move 6; Save 18; CL/XP 2/30; Special: Fear, invisibility, incorporeal, only harmed by silver or magic weapons. 5. At the top of the stairs one sees a long corridor lit by a floating candelabra. 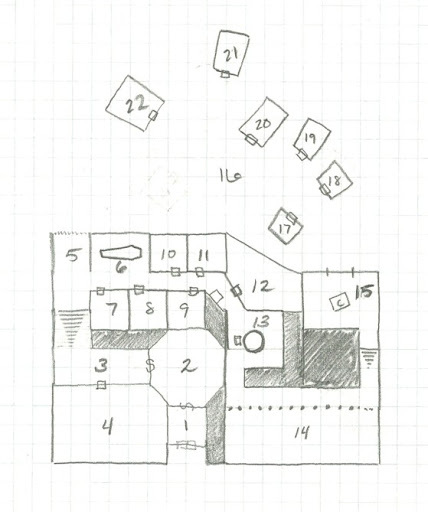 Once adventurers enter 10 feet into the hallway they will be trapped in a pocket dimension – no matter how far one walks in either direction, they cannot leave the hallway without fighting the phantasm holding the candelabra. Phantasm: HD 9; AC 1 ; Atk 1 incorporeal touch (1d6 + level drain); Move 12 (Fly 24); Save 6; CL/XP 12/2000; Special: Level drain, magic jar, desecration. 6. This conservatory holds a coffin that is partially nailed shut. A skeletal entity inside the coffin is attempting to escape while four murder crows look on from above. The crows will attack any who enter the conservatory. The occupant of the coffin is a cadaver – he cannot escape without help. Cadaver: HD 2; AC 6 ; Atk 2 claws (1d4 + disease) and bite (1d6 + disease); Move 12; Save 16; CL/XP 3/60; Special: Disease (fever, -1d3 Con per day until two successive daily saves are made), regenerates 1 hp/rd after being dropped to 0 hp. Murder Crow: HD 9; AC 1 ; Atk 2 claws (1d4) and bite (1d6); Move 3 (Fly 30); Save 6; CL/XP 10/1400; Special: Eye-rake (if both claw attacks hit, save or blindness), when killed it explodes into a swarm of normal crows. 7. The door to this room appears to bulge outward. The room is occupied by a bogeyman, a young woman of aristocratic appearance who made the sad mistake of attending the wedding those many years ago. Bogeyman: HD 8; AC 3 ; Atk 1 touch (1d6); Move 12; Save 8; CL/XP 11/1700; Special: Bump in night, frighten, shadow shift. 8. As adventures enter this comfortable room a swarm of 6 shadow rats will emerge from one wall and attack. Shadow Rats: HD 1d6; AC 4 ; Atk 1 bite (1d3 + 1d2 Strength); Move 6; Save 18; CL/XP 1/15; Special: Incorporeal (only harmed by magic weapons and spells). 9. When one reaches the center of this room, which is decorated with clocks, they will suffer from a slow effect. The room will appear to grow to five times its actual dimensions, and each round spent in the room will age the adventurers 10 years. 10. Two hapless apparitions of twin moneychangers occupy this room for eternity. Their corpses, hacked by a hatchet, are in the center of the room clutching a leather sack of 300 gold pieces. Apparition: HD 8; AC 1 ; Atk See special; Move 15; Save 8; CL/XP 12/2000; Special: Only harmed by silver or magic weapons, sense living creatures, choking. 11. Three ghoulish maids feast on the remains of three bridesmaids in yellow taffeta. If the ghouls are dispatched, the bridesmaids’ skeletons will burst from their bodies and attack. 12. This was the room of the bride, now empty. The wardrobe contains rich clothing of velvet and silk (worth a total of 200 gp) and a jewelry box holds a golden ring on a severed finger. Anyone touching the ring must make a saving throw or be “magic jarred” into the ring – a mourning ring – their body being transformed into a vengeful demiurge. Demiurge: HD 8; AC 3 ; Atk 1 touch (1d4); Move 12 (Fly 18); Save 8; CL/XP 13/2300; Special: Transfix, soul touch, only harmed by magic weapons or cold-wrought iron weapons. Asking her a question causes a tarot card to appear on the table. Picking up the card activates it as though it were from a Deck of Many Things. 14. This balcony overlooks a dining hall. The western portion of the room is occupied by a table filled with a gruesome feast being consumed by wights garbed as though from ancient Rome and Egypt. Other wights are riding chandeliers and drinking from bottles of wine (poison). Portraits of duelists hang on the wall, and the ghosts therein will, every 1d4 rounds, appear over their portraits and fire one of their ghostly guns (or crossbows, if you prefer) at an adventurer. Those hit by a bullet or bolt must pass a saving throw or be paralyzed for one round. The eastern portion of the room holds a dozen waltzing ghosts and a mouldering organ player. His ornate organ draws shadows from the Land of the Dead into the material world. 1d6 shadows appear each round to challenge the party. The organist is a wraith. 15. This attic holds a chest of pirate treasure (10,000 gp worth) and the ghost of the bride, turned into a bhuta by her brutal murder at the hands of her beloved sea captain. The only way out of this room is the window overlooking the graveyard. Bhuta: HD 7; AC 4 ; Atk 2 claws (1d8); Move 12; Save 9; CL/XP ; Special: Death grip. 16. This graveyard offers the only means of escape from the dark dimension of the Haunted Mansion. Each round spent in the place carries a 1 in 6 chance that a mortuary cyclone will arise. Once defeated, the threat of the mortuary cyclone is ended. The graveyard is filled with tombstones and stone crypts. The doors to the crypts are easy to open but difficult to re-open once the crypt is entered. Each crypt is a room with coffins sealed into the floor or resting on shelves in the walls. 17. This crypt is occupied by the ghosts of five musicians. A brass bell hangs from the ceiling, and when rung causes all undead within 10 feet to make a saving throw or be disrupted (i.e. stunned) for one round. Disrupted undead also suffer 1d6 damage. Each spirit has a golden harp that can be seized when the creature is destroyed. Each harp is worth 500 gp and can cast a charm person spell once per day in the hands of a trained harpist. Groaning Spirits: HD 7; AC 2 ; Atk 1 touch (1d8); Move 12; Save 9; CL/XP 12/2000; Special: Chilling touch, aura of fear, keening, only harmed by magic weapons. 18. This crypt holds two aristocratic corpses, now animated as ghasts. 19. This crypt holds the spirit of an executioner and a headless knight. Both are spectres. 20. This crypt appears empty. A loose flagstone reveals a brass lock made for a large key. If the key from area 21 is used, it will cause the entire crypt to sink down into the earth, revealing a long, dark tunnel lined with mirrors. Looking into the mirror will cause a wicked spirit to attach itself to the adventurer (treat as a Bestow Curse spell – no save). At the end of the corridor there is a stairway leading back into the real world, apparently depositing the adventures in a small, stone outbuilding of the Haunted Mansion and into the daylight. 21. This crypt is larger inside than it would appear on the outside. It offers a winding set of stairs down into the earth that end in a small chamber with three doors. The first door holds a gang of four barrow wights guarding a large brass key. The second door holds a crypt thing that will teleport the adventurers back to room 2 in the mansion. The final door holds another set of stairs that seem to go at least 100 feet down into the cold earth. The end in a cavern through which flows a black river of moaning souls. A skeletal boatman waits on the shore, beckoning adventurers forward. The boatman is a charonadaemon, and he will carry adventurers into the realm of Hades. Barrow Wights: HD 6; AC 3 ; Atk 1 slam (1d4+3 + level drain); Move 12; Save 11; CL/XP 9/1100; Special: Gaze causes confusion, drain one level with slam attack (save negates), characters killed by a barrow wight rise as barrow wights one round later. Crypt Thing: HD 6+1; AC 2 ; Atk 1 claw (1d8); Move 15; Save 11; CL/XP 7/600; Special: Only harmed by magic weapons, teleport. Charonadaemon: HD 10; AC 3 ; Atk 1 staff (1d8); Move 15; Save 5; CL/XP 15/2900; Special: Spells, fear gaze, summon demons, only harmed by magic weapons, magic resistance 55%, plane shift, telepathy. 22. This is the crypt of a transplanted mummy. It wears a golden circlet worth 1,000 gp that is poisonous to the first person who touches it (save or die). Apparitions are ethereal undead that are only vulnerable to attack when they themselves attack. They are reluctant to approach mirrors or objects made of pure silver. Apparitions usually speak common. They surprise on a roll of 1-4 on 1d6. Although an apparition cannot actually touch a victim, it creates the sensation of choking; a victim that succeeds at a saving throw is stricken with horror and must flee for 1d4 rounds, while a victim that fails his save must also make a saving throw or suffer a massive heart attack and die on the spot. A victim killed by an apparition will rise as an apparition in 2d4 hours. A bhuta is the spirit of a person who was murdered. For about 2 weeks they appear as they did in life; thereafter they begin to rot and take on a ghoulish appearance. When a bhuta hits with both claw attacks it fastens its hands around the victims throat and chokes for automatic claw damage each round. Breaking the bhuta’s grip requires one to roll 1d20 (adding their strength bonus or penalty) and meeting or beating 18. Bogeymen look like translucent humans with delicate, childlike features. They can create phantasmic sounds and images (per phantom force) at will and those who look upon them must save vs. fear or stand frozen with fear for 1d6+2 rounds. Bogeymen can travel between shadows per the dimension door spell. Charonadaemons appear as skeletal boatmen in black robes. They always have a skiff and staff. They can cast the following spells: Darkness 15’ radius, detect invisibility, fear and teleport (including their skiff). Once per day they can attempt to summon 1d4 vrocks or another charonadaemon with a 35% chance of success. They can steer their skiff into the Astral and Ethereal Planes, as well as the plane of Hades. As daemons, they are immune to acid and poison and suffer half damage from cold, fire and electricity. These undead resemble zombies. Although most coffer corpses attack with their fists, 25% are armed with weapons. Creatures hit by the coffer corpse’s fists must make a saving throw to avoid be grabbed around the neck and choked, suffering 1d6 damage per round automatically until killed; nothing can make it release its grip. Normal weapon appear to do damage to a coffer corpse, but they actually do not. If the creature sustains 6 or more points of damage from a normal weapon, it will go down as though destroyed. It will then rise again, causing fear in those who witness the revival and fail a saving throw. Demiurge are incorporeal spirits that look like humans with sunken noses, empty eye sockets and semi-transparent flesh. Their gaze acts as a hold person spell. A demiurge can fly through a person’s body, forcing them to pass a saving throw or die instantly. Groaning spirits appear as incorporeal female elves. Their touch causes one point of strength drain unless a saving throw is passed. Anyone viewing a groaning spirit must pass a saving throw or flee in terror for 1d6+4 rounds. Once per day a groaning spirit can emit a death wail that forces anyone hearing it to pass a saving throw or drop dead. Phantasms are spirits of pure evil. They look like hooded spectres with tentacle-like arms. The phantasm’s touch drains one level unless a saving throw is made. It can use the spell Magic Jar once per round to take possession of a creature on the material plane. The phantasm is surrounded by a 10-ft diameter aura in which undead are turned as though 3 Hit Dice greater. Phantasm: HD 9; AC 1 ; Atk 1 incorporeal touch (1d6 + level drain); Move 12 (Fly 24); Save 6; CL/XP 12/2000; Special: Level drain, magic jar, turned as a 12 HD creature. Poltergeists are “noisy spirits” encountered where they were originally killed. They are invisible and incorporeal and can only be harmed by silver or magic weapons. They can attack by throwing unattended objects, hitting as though they were 5 HD creatures. Creatures hit by a flying object suffer no damage, but must pass a charisma save or be affected by fear, fleeing in a random direction for 2d12 rounds. There is a 50% chance a victim will drop what he is carrying while fleeing. Holy water and strongly presented holy symbols will drive poltergeists back but not harm them. 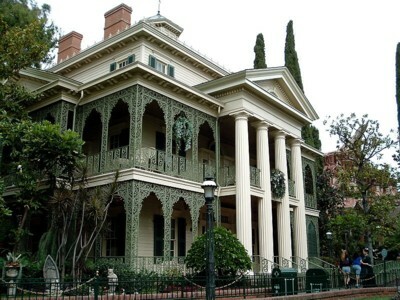 I LOVE the Haunted Mansion at Walt Disney World. It is my favorite attraction and has been since I was five years old. I've not been to the Mansion in Disneyland, but I understand the interior scenes in both the Florida and California theme park mansions are pretty similar. Thanks for this Halloween treat!